I have a partner, two boys 19 and 14 and a step-son 15. I work full-time as a table hand at a printing firm. I like reading Horror and 1800’s classics. Jane Eyre is my favourite book. My star sign is Taurus. I love all sorts of music. Photography and painting are my hobbies until I can sustain myself as an artist. I love driving through the countryside with no destination in mind. My greatest enemy is time. I smile, laugh and think too much. I am writing a book about my life called ‘Vera’. I have tattoos, a butterfly that covers my whole chest, a leopard head surrounded by a tree on my shoulder blade and a new one coming to cover up a mistake made a long time ago on my ankle. I became an artist in my late 20’s. At the time I worked as a behavioral management worker for people with disabilities. While on shift I was attacked by a client. I was diagnosed with post traumatic stress syndrome/major depression depending on which psych evaluation you read. After I got over the physical pain, one of my psychiatrists’ I was seeing gave me the advice that I should paint seeing as drawing was something that I have enjoyed since childhood. I hadn’t picked a pen up in many years let alone having to learn how to paint. I mentioned the idea to my psychologist who helped me to find the self-confidence I needed to actually put the idea into practice. I had no other way of letting it out. When I paint I bleed. I let it all out without a word. After three and a half years of being lost in a medicated coma I needed something that was going to make me feel good. The doctors were giving me the all clear by this time even though I suffered some permanent damage. I wanted to live again on my own with no artificial control or doctors. Therapy for me has now been replaced with my own strength, understanding, paints and brushes. It has been about ten years since my fall into the abyss. I still suffer from depression but I have learnt to control it through knowing my illness and my art. I hope to inspire others to pick up a paintbrush and see what happens. The depression series is some of my finest work. It portrays the constant battle that I have with myself. First painting of the depression series. I started this series while in art college. I discovered the dripping technique. Each branch represents a betrayal. My father holds one for what he once was, my mother another who died when I was sixteen, then there’s one for my accidental overdose at 17 and the lack of self respect and love I had for myself and the last for fourteen years of co-dependency with my ex-husband. My greatest issue with depression is the lack of control we possess over it. Even though we can ease the effects with medication and therapy in the end it comes down to ourselves in obtaining control. So do you give in and fall or do you find the strength to pull yourself up. In the end there is no-one who can really save you except yourself. Part of the depression series. Self Portrait painted in my girlfriend’s flat only days after leaving my ex-husband and two children. It was the hardest decision of my life to date. The greatest sacrifices made are made for love. It has been five years since I painted my former self. I no longer am trapped within the pain of my decision. The ending of sorrow is the beginning of wisdom. To my mouth is stitched closed as I am silenced in telling the whole truth to my children. 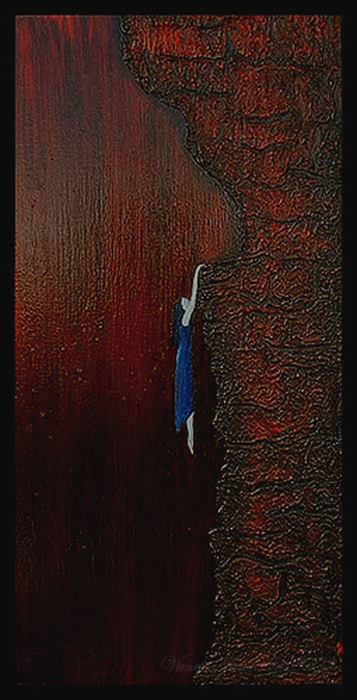 Part of the depression series. 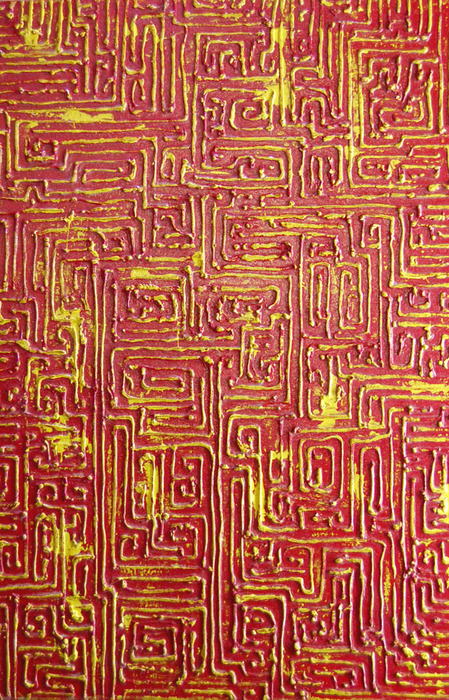 The maze represents the brain and how hard it is at times to understand our own selves. We get lost. Some of us can find our way around and out with ease. For others it’s very hard with many obstacles. Some just think about it, give up or hide. Find the exit point and grow. Part of the depression series but is also a series within its self. Other colours’ are to follow to show different emotional maps this one is orange. Using the no more gaps I traced over it. When dried I laid down the background colour. Followed then by foreground colour which was applied by using a rubber roller. 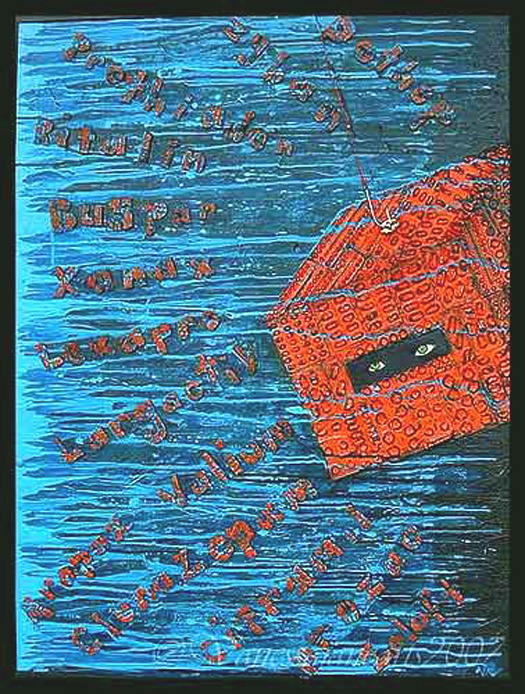 This painting is part of the depression series. The Maze actually works. 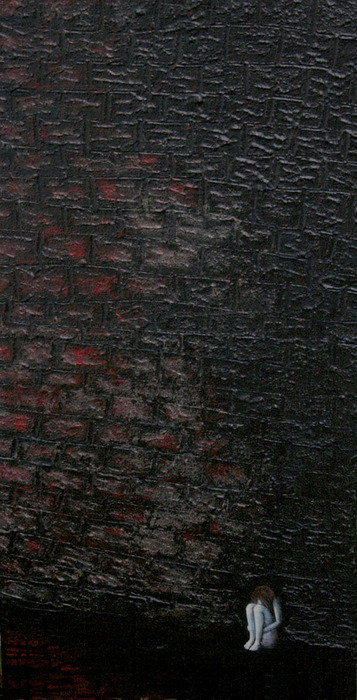 Acrylic on stabbed canvas (top layer) and wood (bleeding background bottom layer). 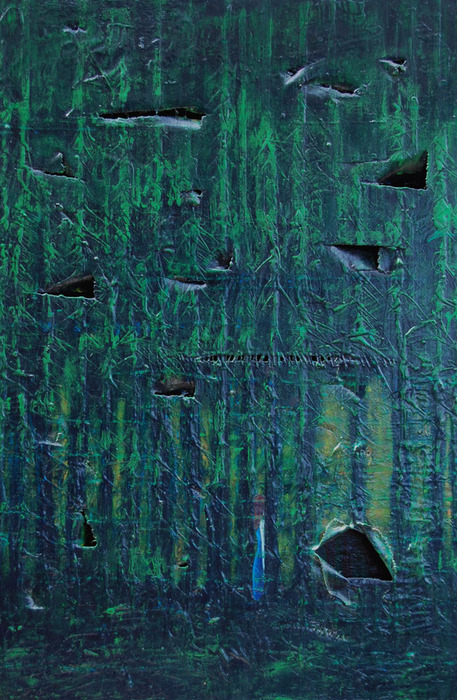 Gel media used in pine trees. Cotton to hand stitch stab wounds. Ripped newspaper used for texture. This painting holds the hurt and anger I feel towards my sister. The stab marks were my anger. The second layer is my bleeding for the hurt. The hand stitching of some stab wounds is for the healing process. Closing the wounds gives the order to leave her behind and move on. The girl is my sister walking in the misty swamp. Overshadowed by the darkness of the pines. Alone. I was listening to and inspired by Nirvana song “In the pines.” Off the MTV Nirvana live album while painting this piece. These lyrics touch me deeply. So much so that this painting is dedicated to it. Part of the depression series. Part of the depression series. I was on antidepressants for about 31/2 years before I decided that I wanted to stop taking them. At the start I needed them. I was unable to function without them. I tried four different types before I found the right one that didn’t have any side effects for me. After a couple of years I started to decrease my doses then I just stopped taking them. I fell spiraling down. I went back to the doc and weaned myself off of them properly. I knew I was feeling better but all the same I was constantly numb and felt artificially controlled. I wanted to smile and really feel it. I now paint to control my depression. Cardboard letters are names of antidepressants, the eyes are a photograph of mine painted over. I am trapped inside the box of pills, swinging on a fishhook and trace trying to find a balance. Mixed media: confetti from paper drill, acrylic paint on canvas. 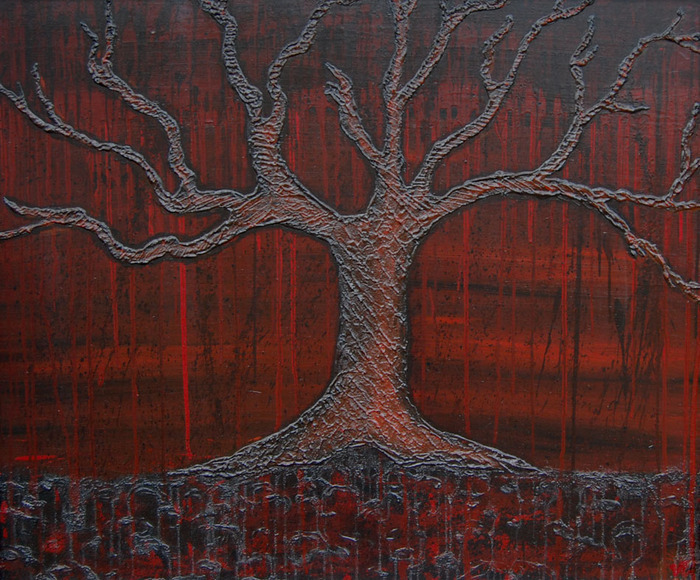 Triptych h: 180cm w: 90cm relief: 1.5cm. 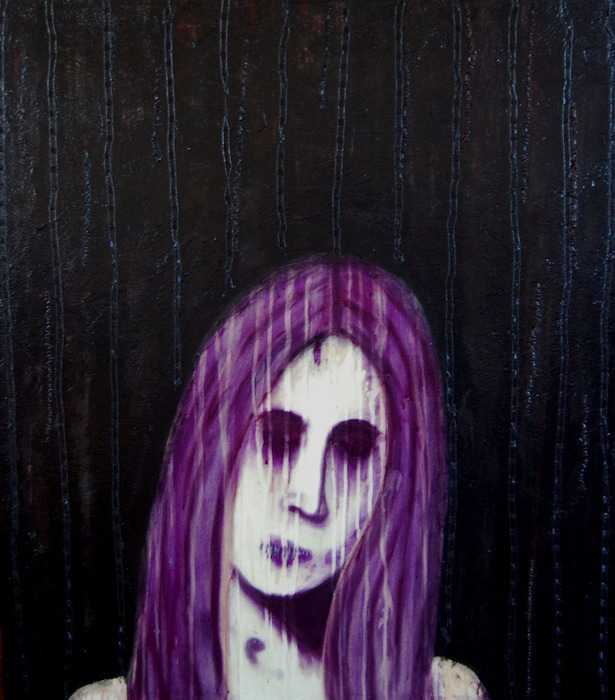 Part of the depression series. Can be hung vertically or horizontally. The undercurrent resembles my depression under the surface. The current lures you in. It takes hold of you and drags you down. You struggle against it but you still hit the bottom anyway. In the darkness you want to drown. The crashing waves (blue and white confetti) resemble the surface and my constant anxiety to reach it, to be so called emotionally normal. Sometimes you find the strength to fight, you break through to the surface and breathe deeply. You lay there floating on the anxiety, exhausted, trying to gain strength while awaiting the next undercurrent to arrive. Tenth part of the depression series. 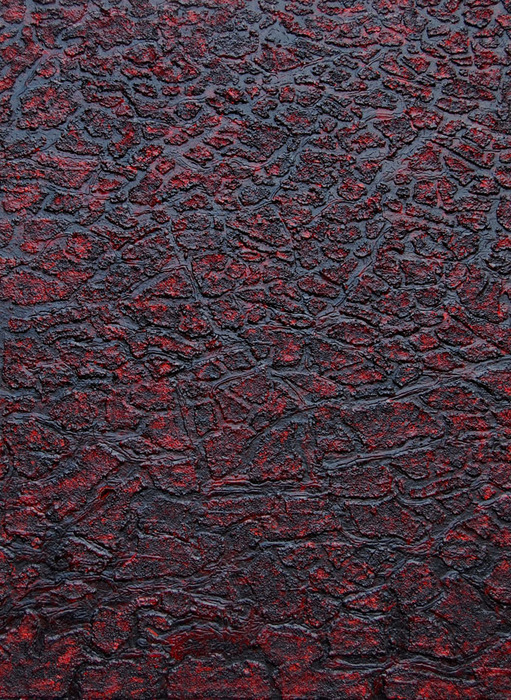 Abstract landscape of a drought that has crippled our nation for decades especially our farmers. The sawdust is used to make the arid cracked landscape. It also resembles the death of vegetation and crops. The blood is for the loss of wildlife, livestock and the life or farmers who lost all hope and took their own lives. I feel a terrible loss for them and their families, as I know what it is like to lose everything including the one you love. changes colour depending on light sorce.